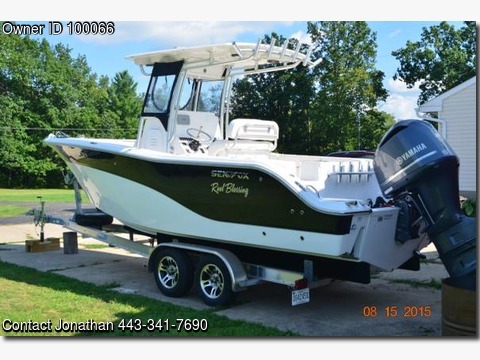 Boat is located in Williamston,Michigan.Please contact the owner @ 443-341-7690…Your opportunity to buy a great used boat and be fishing on the Great Lakes. Relocated from Maryland to mid-Michigan and keeping my awesome low hours fishing boat is no longer practical being so far from water. 9’3″ beam provides a very dry ride – perhaps from Grand Haven to Chicago. Gullwings keep you warmer in cool temps. Loaded with nearly all available options and extra fishing tackle storage. Single Yamaha 300 outboard always fires up first time. Great balance of fuel economy and power. Top speed was 52 loaded on plane on the Chesapeake Bay. Great reliable power without the need for double the maintenance costs dual outboards require. Includes all cushions, CG safety equipment, two covers, some maintenance/cleaning supplies as well as some fishing equipment/supplies. Trailer is 2014, dual torsion axles with spare.